Rogue Legacy...why do you have to tell me I am gay but you don’t tell me when I am straight? Another totally mixed bag for gaming this week for me. My wife and I played only a half hour of Tomb Raider this week. I hate playing in such small chunks, but our schedule just didn’t mash up well this week and she is still getting over a nasty cold. I polished off a couple worlds with my son in Rayman: Origins. Since I told him that we weren’t even going to consider getting Legacy until Origins was done, he has had a single minded determination to get it finished. He’s starting to bring tears to my eyes with his excellent reflexes and timing in what can be a fairly challenging game. Does an old man proud. I had a blast playing Lord of the Rings: War in the North with my friend on our Tuesday night game session despite our irritating problem of having to chat via our 360s. It is a great game and the combat is so much fun. Highly recommended so far. I begrudgingly played some more The Conduit on the Wii. I am almost done, last mission now. If I didn’t have houseguests to prepare for this weekend, I would have maybe had a chance to polish it off. I know it isn’t a great game for me by the lack of drive I have to play it. Generally I am pretty happy to play most of my games and look forward to getting back to them. Not The Conduit. I don’t even know what it is about the game I don’t really like. It looks a little fugly now, the AI is terrible and it feels like a bad knock off of Crysis 2, except it came out years before Crysis 2. It has some good looking moments, some great level design, and I think the control scheme is fun. The voice acting and story are pretty good with the likes of Mark Sheppard, Kevin Sorbo and one of my favourites, William Morgan Sheppard. I think the problem is that it is just simply boring. I’ve played with the difficulty settings to see if that made it anymore fun. Sometimes I play games on too high a difficulty and it wrecks the pacing of the game and makes the run-and-gun games into a creep-and-snipe game. Nothing seems to improve the experience. I’ve given up on the scanning in the last quarter of the game and that improved the pacing a bit, but really it just gets me quicker to the end which is what I want at this point. Can’t really recommend this one unless you only have a Wii and you’ve exhausted the better first person shooters on that platform. I am mildly interested is looking at The Conduit 2 to see if they improve on the formula, but I imagine I never will. I did play some Rogue Legacy for the first time this week, putting off my commitment to The Conduit. It was on sale on Steam and I love the “rogue-likes”. It is pretty cool and I have found myself several times saying, “Ok, just one more run through” and then ending up into the wee hours of the morning. However, I’m not completely blown away yet. I think part of it was that the game was way overhyped to me and my expectations ended up being a little unrealistic. Coming off the absolutely brilliant The Binding Of Isaac as my last “rogue-like”, the bar was set extremely high. Not to say it isn’t a blast to play. Anyone who loved 2D Castlevania titles should be totally at home here. This game should be on 3DS and Vita pronto. The Wikipedia page lists TBA for PS3, PS4 and Vita and I think it would do extremely well on any of these, but it is an absolutely perfect fit for the handhelds. I have one niggling issue with the traits of your characters though. The character traits are randomized. These can range from baldness (no effect in-game but appearance), irritable bowel syndrome (random flatulence), gigantism (your character is larger than normal), hypogonadism (makes you knockback enemies further), plus many others. These traits came be humorous such as hypochondriac where the damage numbers around your character when hit are extremely exaggerated. Traits can also be game changing, such as Vertigo which flips the game on its head and you have to play it upside-down. Then there is the trait - gay. There is no immediately discernible game impact with this trait. After looking it up, it apparently reverses which statue (knight or lady) grants the chicken leg or mana potion in waypoint rooms and changes who greets the player as their lover in the final cutscene. This is alright on the surface, at least to me. However, the exclusion of the trait straight seems to suggest that the gay trait is suggesting something not normal. When included in the company of traits like dementia, dyslexia, near-sighted, color-blind, etc it makes an even stronger suggestion that this is an abnormal trait. Maybe I’m reading too much into it. It is great to have gay characters in games when treated as fully realized characters and not some campy stereotype. 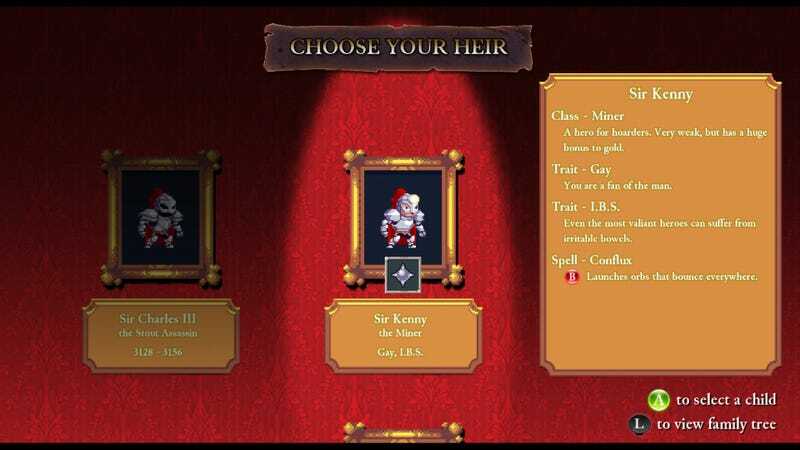 Rogue Legacy isn’t doing this precisely since the characters are just a jumble of random traits and classes with no story to speak of, however it sits slightly uncomfortably with me the way it is presented. Also, the demo for the game has the gay trait description as “You’re Fabulous” and that’s really starting to push my tolerance. It is great this description was removed from the full game. I think if there was a separate entry for sexual orientation and that could be hetero, homo, bi or hell, even furry-sexual then I would be more comfortable with having sexual orientation included with the game. Maybe I am making too much of this. Maybe the devs were just trying to be inclusive and I am just misinterpreting their intent. Anybody else have any thoughts on this? Anyhow, I have guests this Sunday and need to prepare for that so my gaming life is shot for this weekend. What are you playing this weekend? Make it some good ones so I can live vicariously through you for the weekend.